I’ve always appreciated a thought I’ve found in the work of a variety of writers I admire—the end is the beginning—so it was wonderful to find that the formal end of the Unconference for Dreamers, Doers, & Drivers Shaping the Future of Learning in Tempe and Scottsdale, Arizona late last week immediately initiated series of new beginnings that are continuing to unfold as I write this piece nearly seven days later. It was an inspiring, transformative day and a half of presentations, discussions, and planning by teacher-trainer-learner-dreamer-doers from several different countries on a few continents, preceded by an informal evening reception to initiate the entire gathering arranged by Arizona State University Chief Information Officer Lev Gonick with the assistance of Samantha Adams Becker and many others. It immediately produced many productive conversations and initial plans for action. It extended beyond its formal conclusion through a couple of post-Unconference sessions that expanded the group of participants to include members of the Arizona State University community. And, in a stunningly quick follow-up, those involved with organizing the Unconference announced, within days, that as many materials and resources as could be gathered had already been posted on a publicly-accessible website—a site, which in essence, provides a virtual Unconference experience for anyone interested in participating asynchronously. More importantly, the website creates an additional avenue to assure that what happened in Arizona won’t stay in Arizona. It was—and is—dreaming, doing, and driving at a global level. And it is, in essence, a wonderful example of a high-end blended (onsite-online), synchronous-asynchronous experience at its best, with the possibility of rhizomatically-growing conversations and actions that, if successful, could lead to positive changes that will benefit the global community that previously was drawn together and served very well by the New Media Consortium (NMC). The Unconference is simply the latest wonderful manifestation of that community, in a post-NMC environment, seeking familiar as well as new places (onsite as well as online) to continue the work it does so well—in long-term NMC partner organizations including EDUCAUSE and CoSN (the Consortium for School Networking) as well as community member-generated groups including the Slack Beyond the Horizon community which has spawned FOEcast (Future of Education forecast) for those who did not want to lose the global community of teacher-trainer-learner-doers NMC had so effectively nurtured across a variety of sectors in our lifelong-learning environment. There is also a newly-formed LinkedIn group created expressly to continue Unconference conversations regarding the present and future of micro-credentialing not only in higher education but also in many other parts of our lifelong learning sandbox—and many other offshoots that will gain more of our attention in the weeks and months to come as dreams begin to be transformed into actions. “Our minds are still racing with all the ideas and insights you contributed on shaping the future of learning in the digital age. It’s amazing what can transpire when a collection of diverse perspectives are in the same place at the same time. Thanks for coming with an open mind, ready to share your knowledge, dreams, and concerns. The site also includes a link to the Twitter feed produced through #ShapingEdu hashtag which many of us used to extend the conversations beyond the physical walls of the Unconference meeting room and the outside-the-room conversations that continued in restaurants, the hotel lobby, the hotel parking lot, and numerous other locations so that conference “participants” included many colleagues who weren’t physically with us but, in a very real blended-world-sort-of-way, very much with us; accessing and adding to that Twitter conversation was just one of the numerous ways in which the Unconference can be said to have already taken on a extended life far beyond the short period of time during which we were interacting face to face. We have a lot of work ahead of us. And we know that those who were skeptical of and/or critical of what the New Media Consortium and its numerous partners and community members produced, will probably be equally critical and skeptical of what the Unconference dreamers and members of our extended global community of learning are in the early stages of pursuing. But our openly-expressed desire to be inclusive and transparent in our work—in this lovely, dynamic, innovative community of Edunauts in higher education, the kindergarden-through-12th-grade sector, community colleges and vocational schools, museums, libraries, and workplace learning and performance committed to supporting lifelong learning at its best—means we look forward to working with you and anyone else interested in being actively engaged in the process of dreaming, doing, and driving that was so wonderfully visible at the Arizona State University Unconference last week. N.B. — This is the fourth of four sets of reflections inspired by the Unconference for Dreamers, Doers, & Drivers Shaping the Future of Learning in April 2018. If any of us had mistakenly thought that all the dreaming, planning, and neighborhood-building that took place all day last Thursday during the Unconference for Dreamers, Doers, & Drivers Shaping the Future of Learning in Tempe and Scottsdale, Arizona had drained us, we quickly learned otherwise when we formally reconvened for a final half-day of activities Friday morning. Following the pattern we used in our Thursday neighborhood conversations, participants in the micro-credentialing neighborhood set out to accomplish three things: define our unifying dream, establish what we hoped to do in one-, three-, and five-year periods of time, and document what was driving us toward those dreams and actions. The dream, with graphic facilitator Karina Branson helping keep us on track, quick came together: to connect formal and informal learning credentialing and create a confirmed, shared taxonomy so it would be useful to learners and those needing to know how those learners’ experiences match what is needed in contemporary workplaces. 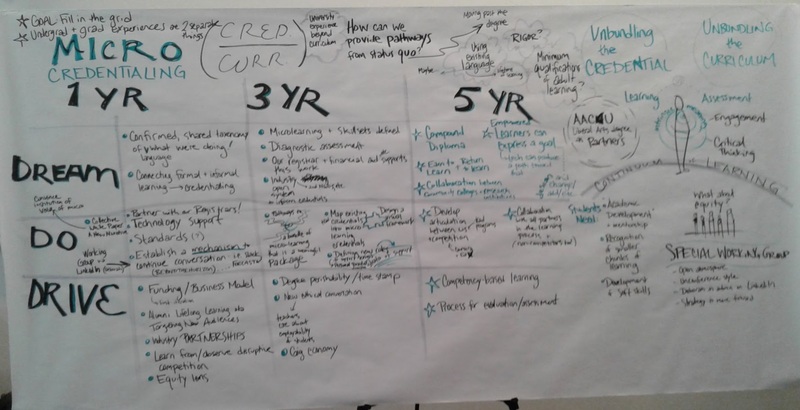 Looking toward the three- and five-year time horizons, we dreamed of helping create a system wherein empowered learners can express goals that would be documented through micro-credentialing; foster more opportunities for compound diplomas; and nurture a lifelong-learning pattern in which earning and learning remain intertwined. ShapingEdu–ASU Unconference_Micro-Credientialing_Group_WorkActions to be taken in the first year of our efforts include attempting to partner with on-campus registrars to see how this system can be created, nurtured, and sustained; see what standards need to be created to serve the overlapping interests and needs of learners and employers; and establish a mechanism to continue the conversation—efforts already taking shape through the creation of a LinkedIn discussion group and efforts to provide a forum for the discussions/planning/actions through our Slack Beyond the Horizon community which has spawned FOEcast (Future of Education forecast). Projected long-term actions to be taken by the micro-credentialing group include attempting to design a visual framework for micro-credentialing and continually seeking ways to foster collaboration with all identifiable partners in the (lifelong) learning process—not just those involved in higher education. There are a number of factors driving many of us toward an effort of this magnitude at this particular time, and there are certainly numerous barriers behind which any skeptic could easily retreat. But that in-the-spur-of-the-moment question about why anyone would commit to four-year learning programs in a world where job and career changes are so prevalent offers one of the best reasons to pursue this effort. And an offhand comment made by my colleague and fellow Unconference participant Tom Haymes made about the need for “exploding the classroom” in the most positive of ways playfully pushes the conversation forward even more. If we’re going to avoid the prediction that at least one colleague made at the Unconference—that our four-year colleges and universities could disappear or be much different in ten years than they are today—then all of us Edunauts who love the richly rewarding and highly varied onsite, online, and blended environments available to us today need to be actively engaged in the process of dreaming, doing, and driving that was so wonderfully at the heart of the Arizona State University Unconference last week. N.B. — This is the third of four sets of reflections inspired by the Unconference for Dreamers, Doers, & Drivers Shaping the Future of Learning in April 2018. One of the more playful and productive exercises at the Unconference for Dreamers, Doers, & Drivers Shaping the Future of Learning in Tempe and Scottsdale, Arizona late last week involved building neighborhoods. We weren’t using hammers and nails, and no hardhats were required. This was an exercise in identifying key issues in higher education and other learning environments; pulling tables together to create neighborhoods of conversation within the conference room in which we were meeting; and then diving into those conversations designed to identify what the residents of the newly-established Unconference neighborhoods held as their unifying dream, what we hoped to do in one-, three-, and five-year periods (horizons, anyone?) of time, and what was driving us toward those dreams and actions. Because of my ongoing interest in finding ways to nurture and sustain a global online community (FOEcast—the Future of Education forecast group unified through a “Beyond The Horizon” group on Slack) that has emerged from the closing and Chapter 7 bankruptcy proceedings initiated by New Media Consortium (NMC) board members in December 2017, I immediately moved into FOEcastville and dove into planning with others inspired by this post-NMC community which is evolving with the addition of members who had no direct, previous connections. Defining our dream was a fairly easy undertaking because the effort had already been underway for a few months: developing a highly-functioning, sustainable community of action that will extend to sectors beyond higher education and will include spin-offs to connect to other learning organizations worldwide. Establishing a list of actions to be completed within one-, three-, and five-year periods also was straightforward. Our year one goals include engaging in strategic planning; continuing to establish mission, vision, and value statements that will guide us and others who join our efforts to identify and promote positive changes within the various lifelong-learning environments in which we work; producing documents that will be useful to those joining us in our efforts to continue contributing to global efforts to shape the future of learning—and make those documents available under Creative Commons licensing; and seeking ways to continue working together online (e.g., through the Slack “Beyond the Horizon” group) and onsite (e.g., through gatherings including the Unconference for Dreamers, Doers, & Drivers Shaping the Future of Learning). Our three- and five-year goals contained an implicit acknowledgment that this is still very much a rapidly-evolving community that draws from the community that existed under the auspices of the NMC and also draws from the extended, rhizomatically-growing community of our non-NMC colleagues who share an interest in collaborating to have a positive impact on lifelong learning throughout the world. With that in mind, a major item on our list is to continually engage in revisions of our implantation plans so we can react to the changes that will undoubtedly occur in our learning environments. We also made the commitment to look for opportunities to establish and/or work with organizations tackling parts of the effort to reshape learning (e.g., those focused on higher education—like EDUCAUSE, which obtained the NMC’s assets through the Chapter 7 proceedings and is proceeding with plans to publish the 2018 Horizon Report > Higher Ed Edition halted by the closing of the NMC—as well as others working in our extended lifelong-learning playground: colleagues in the K-12 sector, community colleges and vocational schools, museums, libraries, and the extensive network of workplace learning and performance (talent development) colleagues. (Those that come to mind for me include colleagues who gather under the auspices of first-rate learning organizations such as ATD—the Association for Talent Development or who are filling unmet learning needs through opportunities provided by LinkedIn/Lynda.com). It was heartening to see so many representatives from so many of these organizations and industries working together during the Unconference to develop plans of action to help reshape learning; Arizona State University Chief Information Officer Lev Gonick did an amazing job of pulling together a broad coalition of stakeholders in the conversation from a variety of countries. Our colleagues from EDUCAUSE were active participants in the process of attempting to determine how our post-NMC world will take shape. Several members of the former NMC community accepted the invitation to present lightning talks to stimulate the conversations. The result of these combined efforts and commitment to innovation was that any participant interested in being part of our ongoing efforts to better serve our learners had plenty of opportunities to find a place to engage in what will be an ongoing, dynamic shaping process—with an eye on producing concrete, measurable results. We also need to acknowledge the importance of the conversation facilitators in an endeavor at the level of the Unconference and those neighborhood-development sessions. FOEcast co-founder Bryan Alexander led our FOEcast neighborhood’s discussion. Lev contributed tremendously through his facilitation of the entire Unconference. And graphic facilitator Karina Branson seemed to have the ability to be in the right place at the right time to keep conversations progressing in positive directions throughout the entire Unconference. 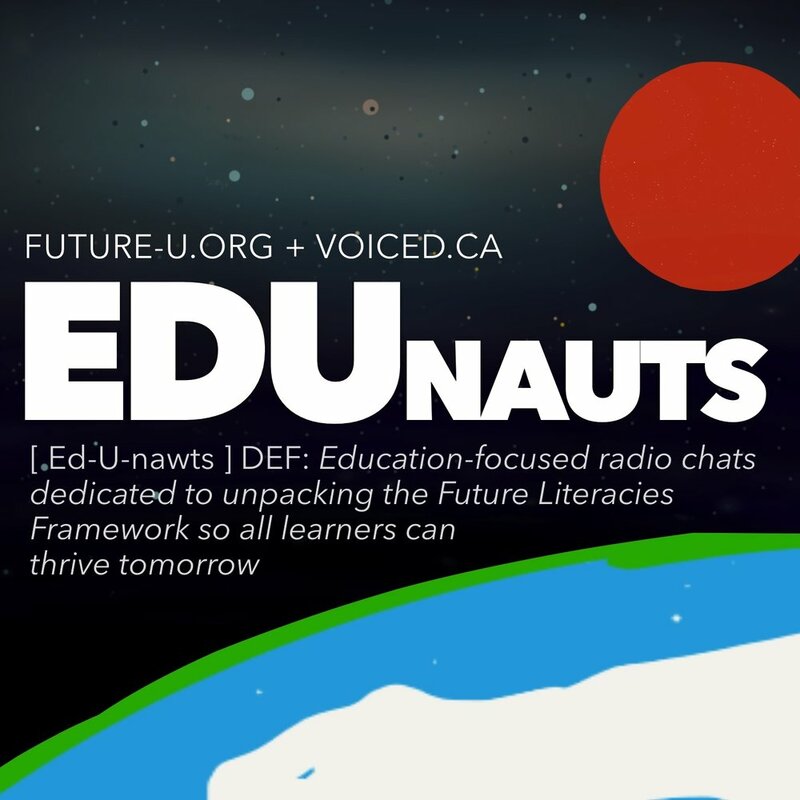 As our highly-motivated group of Edunauts reached the end of a day of dreaming, sharing, and planning for a future we very much want to help create, we did exactly what the event was designed to stimulate: continued our conversations well into the evening in small groups over dinner. And when we reconvened Friday morning for our final hours together onsite, we were ready to take our efforts even further. N.B. — This is the second of four sets of reflections inspired by the Unconference for Dreamers, Doers, & Drivers Shaping the Future of Learning in April 2018. This is the second part of a two-part interview conducted with Jeff Merrell, Associate Director of Northwestern University’s Master’s Program in Learning & Organizational Change, for my book Change the World Using Social Media (Rowman & Littlefield; projected publication date is autumn 2018). The interview was conducted online using a shared Google Doc, and has been lightly edited. In a world where employers encourage employees to be available around the clock via the use of mobile devices, is the old rule of thumb “don’t talk politics at work” even a realistic approach anymore, given that lines between personal and professional activities are being inadvertently erased–through actions rather than by design? Ah. There’s the $1,000,000,000 question. Look, for me, it starts and ends with the organizational culture. I would not attempt to have “let’s talk social issues” discussions on a large scale if my company or organization did not do that naturally, in other forms. I am going back to my blog post rant a bit here, but I think some things like #MeToo, news around things like Charlottesville, can inspire some short-term discussions of topics within an organization’s online spaces. Maybe it allows people to—in a tiny way—share something that they’ve wanted to say. I’ve heard examples of this. But, for longer term impact, I think organizations need to think about how they “talk” about these issues routinely, in hybrid ways, where the online conversations are extensions or variations of what happens in other ways. If your organizational culture isn’t strong enough to handle that, or your organizational philosophy does not incorporate some strong element of social impact, then you are not going to get very far. It’s. Not. About. Social media. Thanks. That’s really helping me to clarify something I’ve been exploring through these interviews: the impact that social activism through efforts including #MeToo have in settings far beyond what those involved may have originally thought would occur. I’m finding that few people are looking at the professional social media tools, e.g., LinkedIn, Slack, and Yammer, as means to foster social change. Thoughts on how those might fit in to what you just said in terms of conversations among our professional colleagues onsite as well as online? Well, let’s start with LinkedIn. LinkedIn is about your “brand.” So right there, you are screwed unless you as an individual are seeking to be branded as social activist. But I would suspect—maybe I am wrong—that someone with that mindset would find LinkedIn just not a fit. It’s about people trying to create professional brand in the traditional corporate model. Slack and Yammer, and similar, allow more co-construction of “space.” A group of social activists, within an organization, could easily start up a Slack community of trusted peers etc., set norms for participation, and maybe have a go of it. But again, if the organizational culture is not accepting, respecting of that kind of conversation, then it will likely just be some dark secret thread. Where there is hope is when these spaces become places where people might be able to explore difficult topics and the organization is OK with that. About halfway through the “There is hope in pushing a conversation” section of your “Revisiting: A critical pedagogy for organizational learning?” post, you talk about a “kind of collision between the ‘outside’ social world and internal organizational world…” Have you seen positive change result among those with whom you work as a result of the interactions taking place in the layered communities you mentioned earlier in this conversation? Let me start over with a couple of examples. Two of the most powerful “open” discussions we’ve had within our community (so…open to the entire community, but not open to the public) have been about 1) Being a Muslim—visiting student—in the U.S. and 2) the challenges of being a female in tech. In both cases, these are very strong, female leaders who opened these discussions. And each was spurred by some outside event. Each also said—they would not write what they wrote anywhere else than within the community we created. And each, also, were very savvy social media users—blogging, on Twitter, etc. Positive change coming from it? Not sure I can point to the lives of Muslim students being any “safer” or that women in tech are better off now. But there is a history here that now proves and demonstrates that our [learning] community—MSLOC—can take on these topics and explore them and learn from them. That sort of takes us into the area of the same blog post that discusses “intentionally subverting the norm” as a way of fostering change. Any additional guidance you would offer readers in terms of the impacts that approach can have within organizations as well as onsite and online communities? Yes, this is an interesting question. I recognize that there is some “power” at play here in what I am about to write, but I think a key is calling out (in a positive way) when “subverting the norm” happens. So, say I am a community manager or a leader and recognize that some set of voices are challenging our assumptions, but the challenge is productive in some way. For me, a key is just calling that out: Hey, this is great! We may not agree on all of it, but we love the critical thinking. And maybe engage in some true active listening—online or off—that results in some change in practices or routines. I see those moments in facilitating classes. So, my perspective comes from that. If I am doing my job well, I am recognizing and encouraging multiple voices to be heard and to challenge assumptions. How can you foster trust and safety in online environments when incivility is rampant? I say that half-jokingly. But it gets to my culture bit. If you bring in people who want to be civil participants, and you create a culture that allows for all voices to be heard and respected, then you’ve got a chance. But if all you are about is brand, making as much profit as possible by taking advantage of employees or customers, and beating the competition by any means possible, you’re hosed. N.B. — Paul is currently writing Change the World Using Social Media, scheduled for publication by Rowman & Littlefield in Winter/Spring 2019. This is the eleventh in a continuing series of excerpts from and interviews for the manuscript in progress. This is the first of a two-part interview conducted with Jeff Merrell, Associate Director of Northwestern University’s Master’s Program in Learning & Organizational Change, for my book Change the World Using Social Media (Rowman & Littlefield; projected publication date is autumn 2018). The interview was conducted online using a shared Google Doc, and has been lightly edited. Let’s start with an attempt to set context: can you provide a brief summary of the enterprise technology and organizational learning course you’re currently facilitating or simply cut and paste the course description into this document here? This course explores enterprise social networking technology and its impact on organizational knowledge and organizational learning in the workplace. The course will introduce theory, concepts and frameworks to help you understand knowledge sharing and learning within communities and networks of practitioners, the unique attributes of social networking technology as it applies to organizations, and current uses of network technology to change the way people work or learn (i.e., crowdsourcing and personal learning networks). Finally, you will learn to apply course concepts through prototyping, class projects and business cases. Our M.S. program, for the past 6+ years, has used Jive as our “learning” platform. We intentionally tried to create more of a workplace feel for our program, rather than using an academic LMS [learning management system]. Jive is an enterprise social network platform that allow us to have dialogue and interactions within courses—privately—and across our entire community of learners, faculty, staff, and alumni. All within one space—and it very much looks like a corporate social intranet. So, in my course, I have the advantage of leveraging our platform to talk about the issues of enterprise social media. But we also look at things like Yammer, Slack, and, sometimes, other platforms—Chatter—to get a sense of what the field looks like. But at the end of the day, the course focuses on how enterprise social media and people co-construct/co-constitute the environment. We’re not techno-determinists. A phrase you just used—“across our entire community of learners, faculty, staff and alum”–perfectly captures what has been so attractive to me in all the work I’ve seen you do since we first met in a MOOC several years ago. Is there a strong sense in your course community that the classroom is the entire world since you so frequently engage participation that encourages collaboration between those enrolled in a course and those who are practitioners, participating with you and your learners through social media? I think what student come away with, appreciating—I hope! !—are the “layers” of community and networks created by different levels of privacy. So, our class group—community—of maybe 25 to 30 people is only visible to those enrolled in the course. We work hard to create a safe learning space there. The next layer above that is the MS Learning and Organizational Change “community”—some 250 to 300 people. And then, finally, the outside world—Twitter, etc. What we look at is: What does it feel like to exist across those communities? And why is that important to understand? The conversation tend to get at safety, trust—“knowing people,” as in close social ties. Keep in mind that all of our students meet face to face as well, so they do know each other. But for anyone leading in today’s organizations, my bias is that it is important to understand these layers of privacy and community and how that impacts experience. Remembering that readers of this book are people interested in better understanding how to use social media to foster social change, what specific guidance would you offer them in the following areas: What does it feel like to exist across those communities? And why is that important to understand? Persistence and visibility—two of the affordances of enterprise social media—scare people, especially in a professional setting. In smaller-scale communities, with a community manager or facilitator who maybe speaks the professional language of the community, you can begin to create a safe place to share. You can create norms that—hopefully—prevent and mitigate the risk of unproductive comments. But that does not mean that the culture you create in that smaller community necessarily translates to something more public. The more visibility, the more people just freak out, or self-monitor what they do or do not say. So, if my goal is to have open discussions about critical, tough issues—and I want a variety of voices to be truly heard—don’t assume that because people are open in one tight community that they would be willing to say the same elsewhere. We have amazing, sensitive conversations in our class groups. They rarely “leak out” to the larger community, even when we nudge students to do so. It’s a difficult trick. N.B. — Paul is currently writing Change the World Using Social Media, scheduled for publication by Rowman & Littlefield in Winter/Spring 2019. This is the tenth in a continuing series of excerpts from and interviews for the manuscript in progress. Shortly before the devastating recession of 2008 began, I accepted invitations from two business associates to join LinkedIn—the social media tool designed to help business colleagues stay in touch with each other and with those who might be able to provide job and other business opportunities. As the recession deepened in 2009 and my work and flow of income diminished to a trickle, I became more committed to staying in touch with a variety of colleagues and potential clients through updates I posted on LinkedIn—which, at the time, was the only social media tool I was exploring and using. My posts on that account—generally no more than five each week, and sometimes none at all because I didn’t post anything unless I thought it would be of interest or use to those in my slowly growing LinkedIn network—were always very focused. I would share links to articles and other resources my colleagues and prospective clients might not otherwise see. I posted brief (Twitter-length) updates documenting the efforts I was making with colleagues on a board of directors engaged in what was ultimately a successful effort to help a struggling chapter of what was then ASTD (the American Society for Training and Development) and later became ATD (the Association for Talent Development) survive and once again begin to thrive. I occasionally posted summaries of what I was learning and doing as a volunteer in the marketing department of the Asian Art Museum here in San Francisco. There were also posts leading to articles and other resources I was devouring while completing work on my Master of Library and Information Science (MLIS) degree through an online program at the University of North Texas. About halfway through 2009—a period of time when my income had dwindled to a trickle and prospects for new contract work were non-existent—I started hearing comments from friends and colleagues who, with the words “You seem to be everywhere these days,” made me realize I still very much had a presence in my business communities even though I wasn’t seeing much in the way of cash flow or new contract work. Curious about the disparity between the reality of my situation and the comments I was hearing, I started asking people to define what “being everywhere” meant to them. The unanticipated answer, of course, was that those LinkedIn posts about the volunteer work I was doing to support major local community groups and the consistent sharing of resources my friends and business colleagues valued left them with the (incorrect) impression that I was weathering the recession well. Recognizing the value of being actively, positively present on LinkedIn and continuing to contribute to my various overlapping and increasingly well-integrated communities—business, volunteer, learning, and social—helped me to focus even more on remaining engaged at a time when engagement felt almost completely futile. I spent at least an hour each week looking for ways to make my own LinkedIn account a valuable resource to anyone who spent time looking at it—beefing up sections with links to articles I was writing; reviews of books of interest to those to whom I was connected in LinkedIn; and links to slide decks others could use or adapt in their own work. The combination of remaining tremendously active as a community volunteer throughout 2009, completing work on that MLIS degree, and sharing highlights of what I was doing led, unexpectedly, to an entirely new (paid) business opportunity in early 2010: becoming part of a team of trainers who, for six months, traveled throughout Northern California helping hospice workers learn to use software on mobile devices to more efficiently serve their patients. This, in turn, led to projects that introduced me to collaborative social media tools including Yammer and, more recently, Slack (Searchable Log of All Conversation and Knowledge) and Trello—tools designed to facilitate blended conversations that help bring projects to fruition. In thinking about how LinkedIn can be an important, productive, and often-overlooked element in our toolkits to foster positive social change, I keep returning to the idea that LinkedIn as well as Yammer, Slack, and many other social media collaboration/project-management tools are seen primarily as business resources—tools that can be and occasionally are used by activists, but seldom seem to be to the full extent possible. A fabulous comprehensive paper written in 2012 by Andrew M. Calkins and published in 2013 as a Julie Belle White-Newman MAOL Leadership Award winner at St. Catherine University, “LinkedIn: Key Principles and Best Practices for Online Networking Advocacy by Nonprofit Organizations,” leads me to believe that little has changed over the past six years in terms of LinkedIn making the transition from being a potentially rewarding resource to becoming a resource widely used by those committed to fostering positive change in their communities. With a bit of creativity and effort, I suspect we can better take advantage of the potential of LinkedIn, combined with many other social media collaboration/project-management tools, to better reach and engage members of our professional/business communities into our efforts to help change the world. N.B. — Paul is currently writing Change the World Using Social Media, scheduled for publication by Rowman & Littlefield in Winter/Spring 2019. This is the ninth in a continuing series of excerpts from and interviews for the manuscript in progress. I was feeling wired in the best and worst of all possible ways after feasting on nonstop, extremely intense face-to-face and online contact with colleagues at American Society for Training & Development (ASTD) and American Library Association (ALA) conferences recently. The cumulative effect was wonderfully alarming—or alarmingly wonderful, depending on your own attitudes toward social media tools. The positive result was that engaging with colleagues face to face and via Twitter backchannels created a remarkably rewarding level of engagement. The worrisome part was that the nonstop engagement created a social media/digital equivalent of delirium tremens in the days immediately following each conference. Some of the contradictory responses should not, in retrospect, have been difficult to anticipate. I did, after all, move without any sort of conscious transition into dawn-to-dark social media immersion from a routine habit of spending an hour or less each day engaged with others through Twitter, Google+, LinkedIn, and Facebook; the exception to my usual habits generally comes in the form of a weekly or biweekly engagement in a formal online discussion session, e.g., a tweet chat, or through the act of live-tweeting an event for colleagues who cannot be present. The conference interactions turned those patterns completely on their virtual heads. Conference days generally began with a quick skim, on the screen of my laptop, of the conference backchannel feeds via TweetDeck; this helped me spot last-minute announcements regarding events I didn’t want to miss, or summaries of presentations and discussions I wasn’t able to attend. Then I would skim a (print) copy of a newspaper before switching over to a mobile device (in this case, a Samsung Galaxy tablet) to keep up with the various feeds throughout the day. I would turn back to my laptop when I was live-tweeting events I was attending or writing blog postings late each evening. As I’ve written elsewhere, the level of engagement was spectacular; the combined online and face-to-face contacts produced connections I otherwise would have never made. But the predictable crash was quick to come in the days immediately following each conference. I found myself compulsively continuing to follow the backchannel post-conference feeds via my tablet. Craving and missing the obvious social media buzz that comes from that level of stimulation. And feeling as if the transition from conference routines back to normal day-to-day routines was not happening as naturally as it had in the past. Armed with memories of those observations and recognizing that I needed my own digital fast, I set aside a Saturday recently when no one was expecting me to work. I could actually feel my body and my thoughts relaxing as I opened the pages of a book that morning and slowly relished the joy of slowly absorbing thoughts from printed sources rather than feeling as if I had to race from tweet to tweet. Brunch with my wife was a relaxing and invigorating combination of conversation and time spent skimming that day’s edition of The New York Times—in its printed format. A walk through parts of San Francisco that afternoon gave us time to talk as well as simply take things in, and dinner in the relative silence of our home—no television, CD player, or radio providing distractions—led to a quiet evening without interruptions. Beginning the fast with the intention of letting it run from midnight to midnight, I actually was in no rush to check for messages the following (Sunday) morning, so the fast actually continued well into the afternoon. By the time I wandered back to briefly check for phone messages—nothing pressing there—and online contacts, I realized I had accomplished what I set out to do. Set the virtual world aside for an all-too brief retreat. Slowed myself down significantly. And managed to break the compulsive need to monitor those post-conference backchannels and other online enticements. So I’m back to normal patterns of online interactions. And apparently none the worse for wear.